Industrial Radios are used for wireless over air transfer of data. Each model of radio has its own communication protocol which does not allow communication across brands. 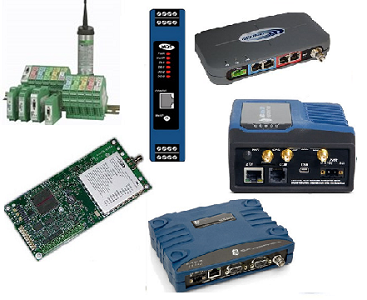 There are three typical types of data radios which are Serial, Ethernet, and IO radios. Serial Radios have one master radio in a network that talks to many slave radios in that same network. Each network can only have one master radio that polls the slave radios one by one. Each slave radio has to wait for the master radio to poll that slave radio in order to send and receive data. The radios can’t send and receive data at the same time. For these reasons, serial radios are a slower form of communication and could take several minutes to communicate. Ethernet Radios have on Access Point in a network that talks to a number of remote radios. Each network has only one Access Point radio communicating to a number of remote radios. Ethernet radios can send and receive communication at any time without being polled. Ethernet radios can also send and receive data at the same time. This makes the communication between radios and stations very fast. The way it can communicate so fast is through several frequencies the data is sent in packets on several frequencies at once called frequency hopping. A Bridge in a radio network allows an Access Point to communicate to another Access Point across networks therefore bridging the networks together. IO Radios are used for wire replacement in situations where it is too expensive or not feasible to run wires but still need to send the data as if it was wired. IO radios have a shorter range typically in feet instead of miles. IO radios have a standard amount of analog and digital signals both in’s and out’s. The IO radios also have expansion modules which allow you to expand the I/O count.